Clement W. Fugh, son of the late Reverend Joseph and Deborah Malone Fugh, is a native of Memphis, Tennessee, where he attended the public elementary and high schools. He continued his education at Memphis State University (BBA), Boston University School of Theology (ThM), with additional studies at Atlanta University, Payne Theological Seminary, Memphis Theological Seminary, and United Theological Seminary (DMin) as an “H. Beecher Hicks Scholar.” Bishop Fugh, an ordained Elder in the African Methodist Episcopal Church, and has served as the Pastor of congregations in Tennessee, Kentucky and Ohio. At the 46th Quadrennial Session of the General Conference of the AME Church, held in July 2000, he was elected as its 5th General Secretary and Chief Information Officer. 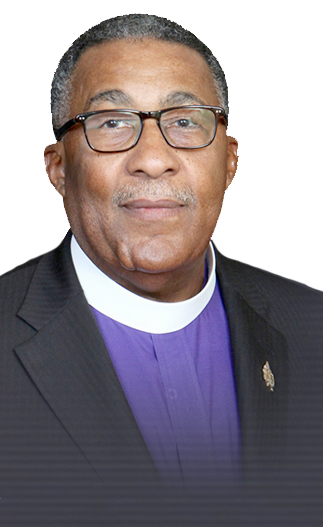 At the 49th General Conference, held in 2012, he was elected and consecrated the 131st Bishop of the AME Church. He was assigned General Superintendent of the 14th Episcopal District, comprising the African countries of Sierra Leone, Ghana, Liberia, Nigeria, Cote D’ Ivoire, Togo and Benin. A member of the World Methodist Council, he attended its Quinquennial Meeting in Nairobi, Kenya in 1986, its 2006 meeting in Seoul, South Korea, and in September 2013, a meeting of the Council at Wesley’s Chapel in London, England. Among his other significant accomplishments are: Secretary, Commission on Worship and Liturgy for the AME Church, which was responsible for producing and publishing the Bicentennial Hymnal and The AME Church Book of Worship; Secretary, Compilation Committee, The Doctrine and Discipline of the AME Church, 1988; Member, Core Strategic Planning Committee for the AME Church; Member, Editing and Revision Committee, The Doctrine and Discipline of the AME Church, editions 1992, 1996, 2000, 2004, 2008; Secretary, Board of Trustees, Payne Theological Seminary; Contributor to: Liberation and Unity, a Consultation on the Church Union sponsored devotional; African American Devotional Bible & The Pastor’s Manual for the Twenty-First Century. Bishop Fugh is married to Alexia Butler Fugh, a Registered Nurse and Clinical Research Consultant. They are the parents of two adult children, Marcia Fugh-Joseph (son-in-law Paul Steven Joseph II) and Joseph Edward Fugh. They are the proud grandparents of one granddaughter, Taylor Joi Joseph and grandson, Paul Steven Joseph, III.